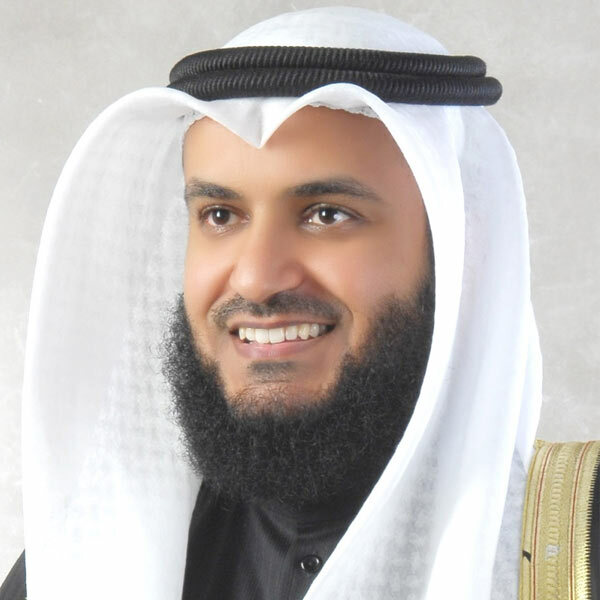 Sheikh Mishary Rashid Al-Afasy or Mishary Rashid Gharib Mohammad Rashed Al-Afasy is a Kuwaiti international-renewed reciter. He was born in Kuwait on September 5th, 1976 ( Sunday 11th of Ramadan 1396 H). He studied Quran in the College of the Quran and Islamic Studies at the Islamic University of Medina ( Kingdom Of Saudi Arabia), in specialization ‘the ten readings and translations of the Quran’. He has read the Quran to Sheikh Ahmed Abdul-Aziz Az-Zayat, Sheikh Ibrahim Ali Shihatah As-Samanody, and the Sheikh Abdul-Rafi` Radwan. He impressed number of great scholars of Quran. Sheikh Alafasy is he Imam of Masjid Al-Kabir (Grand Mosque) in Kuwait City, and every Ramadan he leads the Tarawih prayers in this Mosque. Recently, Sheikh Mishary Rashed Alafasy has visited two mosques in the United States of America : the Islamic Center of Irvine (ICOI) in California and the Islamic Center of Detroit (ICD) in Michigan. Alafasy has two Space Channels specialized in the recitation of the Quran. Sheikh Alafasy is married and has two daughters. He’s also nicknamed Abu Nora.